Grosgrain: No More Red Knees and Elbows. ComforTrack Changes All of That! No More Red Knees and Elbows. ComforTrack Changes All of That! Those of you who currently have a sliding shower door know how inconvenient it is to try and do any bath activity with that pointy metal bar that sits across the lip of your tub. From bathing your kids to bathing the family dog to washing your feet to scrubbing the tub, kneeling and sitting on that bar is nothing short of downright painful. I'm sure you have your red knees and elbows as proof! Finally,Sterling shower doors with ComforTrack technology changes all of that. The bottom bar is made of a flexible yet extremely durable material that bends to applied pressure, allowing the user to kneel, sit of lean on the track, making it easier and more comfortable to bathe a child or a pet, access the shower or clean the bathing/ showering space. It also has a low-profile which makes it easy to clean. It's available for BOTH bath and shower doors. My in-laws have the old-fashioned bath doors and I would greatly appreciate having a new Sterling Prevail shower door when I'm sitting on the side of the tub washing the mud off of my kids when they're done playing outside. And I'm sure they would love having a new Sterling Prevail shower door when their grandchildren stay over and decide to take a bath and they have to sit on the side of the tub to wash their hair. I'm kind of wondering why shower doors weren't always made this way! What about you? Haven't you ever wondered why that bar has to be so painful? 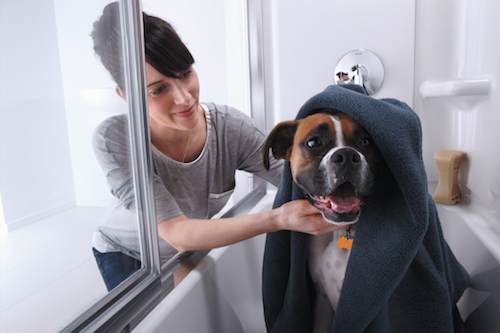 If you also have a shower doors how would the new Sterling Prevail shower door change your everyday bathing routine? I miss the posts when you actually sewed something. I get that you want to make money, and you have 3 or 4 kids. But I miss the frock by friday, and other things you did that were interesting and creative. @AngelaI totally agree with you! We just moved into a new house and I have a ton of projects on my list. Please stop by again and you should be seeing more creative stuff again!